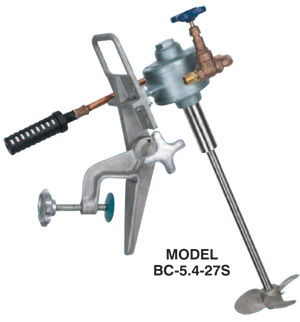 Neptune's clamp mounted, air driven mixer uses 316SS shaft and 316SS marine propellers. Knob allows clamp to be loosened without tools to adjust shaft angle. Handle allows firm grip on mixer when positioning. Three blade left-hand marine propellers pump downward in normal operation. Air control valve included to allow speed adjustment. Motor may be stalled without damage. BC-5.4-27S 1 HP Air Motor 5/8" 27" 6" 6"
BC-5.4-36S 1 HP Air Motor 5/8" 36" 6" 6"
BC-5.4-48S 1 HP Air Motor 5/8" 48" 6" 6"
BC-7.4-36S 2 HP Air Motor 3/4" 36" 8" 8"
BC-7.4-48S 2 HP Air Motor 3/4" 48" 8" 8"
BC-7.4-60S 2 HP Air Motor 3/4" 60" 8" 8"
Air set not included. Order P/N 100804 for complete air set consisting of regulator, filter and lubricator. * To specify dual props: change "S" in Model Number to "D".